The Hunter Valley is like a great embayment in the wild escarpment that runs up the coast of New South Wales. Reaching north-west from its mouth at Newcastle, the valley is a wide, rolling basin surrounded on three sides by mountains. On the southern side, the broken sandstone of Wollemi National Park falls in abrupt scarps to the valley - the northern limit of the Greater Blue Mountains landscape. The north side of the valley is defined by even higher ranges, radiating out like the spokes of a wheel from the rainforest and subalpine hub of the Barrington Tops plateau and sending numerous pristine rivers plunging towards the Hunter. Barrington Tops National Park is the southern extremity of another The Gondwana Rainforests World Heritage Area that stretches to the Queensland border. A chain of reserves protects the most ancient lineage of Australia's plants, while the Blue Mountains represent the more recent eucalypt heritage - two wild chapters in the same story, facing each other across the low, dry, civilised basin of the Hunter Valley. At the head of the valley, the basin almost squeezes through the encircling mountains to the tablelands beyond. The narrow ridgeline of the Liverpool Range forms a winding connection between the rugged escarpment areas to either side. Its position in the landscape lends the Hunter Valley an amazing diversity – of landforms, of ecosystems, of human activity and for visitors. 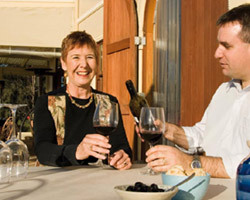 Stretching through Cessnock and Singleton to Muswellbrook, Scone and Merriwa, the Hunter Valley is an agricultural and coal-mining region with a constant backdrop of sandstone escarpments - and an ideal climate for producing fine wines! Agriculture became the main impetus for colonial settlement of the Hunter after a penal colony was established at Coal River (Newcastle) in 1804. Settlers flowed onto the fertile plains rapidly after the first overland route from Sydney to Singleton was established in 1819. The local Aboriginal people of the Wiradjuri and Wannaruah languages must have soon regretted their friendly advice to explorer William Howe on the best route, for the white invasion spelled disaster. The indigenous people and their native game animals were pushed out of the prime grounds of the valley, and disease, starvation and violence took a terrible toll. Today the Wannaruah and Wiradjuri people of the Hunter are strong in their culture, and reinforcing bonds with their Country. For visitors, the rich landscapes and natural wonders, the history, cultures and villages offer one of the most varied destinations in New South Wales. The sandstone expanses of the Monundilla and Mellong sectors of the Greater Blue Mountains World Heritage Area are mostly lonely wilderness of open forest and ochre rocks. Even bushwalkers rarely venture into some places, and yet an exceptionally rich heritage of Aboriginal rock art and occupation sites tells a different story about those who knew the country most intimately. Through this labyrinth of ridges and creeks winds a long ridge that looks no different from all the others. The east-west Hunter Range is geographically important because it is the watershed that divides streams draining north to the Hunter Valley from the Colo River and the Hawkesbury-Nepean catchment. The western end of the Hunter Range – and the edge of the World Heritage Area - is marked by a knot of high, basalt-tipped volcanic peaks with musical names like Coricudgy, Kekeelbon, Coriaday and Coorongooba. They rise above the general level of the sliced-up sandstone plateau and support lush wet sclerophyll forests and rainforests. One flat-topped mountain that stands apart from all the others, near the remote middle of the Hunter Range, has given its name to the World Heritage sector – Mount Monundilla. Heading east across Wollemi National Park, the Hunter Range crosses the north-south Mellong Range, then into Yengo National Park of the Mellong sector and on into the Wollombi Valley. Beneath those sinuous ridgelines, but hidden from any view across the plateau tops, a myriad creeks have cut narrow gorges into the layers of sandstone and shale. Often the creeks are lined with ferns and rainforest, and some plunge into slot-like canyons. Several of the largest creeks that run north into the Hunter River open out downstream into wide, cliff-lined valleys. Widden Brook, Baerami Creek and Martindale Creek, with their alluvial soils enriched by volcanic sediment washed from the tops, were very attractive to early settlers. Today the cleared valley floors support grazing properties and horse studs – in one of the most spectacular pastoral settings anywhere. Spreading south from these valleys, all the way to the central Blue Mountains, lie untracked solitudes where dingoes and lyre-birds call – and where the Wollemi Pine remained hidden to modern eyes for 200 years. And yet there is many a place where visitors to the Hunter region can connect with what truly is the wildest country in New South Wales.